Vapor Tight plastic light diffuser enclosures are completely dust- and moisture-resistant gasketed enclosures. They are constructed of a fiberglass upper body and a high-impact acrylic/DR crepe pattern diffuser, securely positioned in a permanent, poured-in-place sealing gasket. The diffuser and upper components are locked by retaining latches, ensuring a secure, tight seal. At Diffuser Specialist you can find many different sizes for vapor tights, as well as essential accessories. 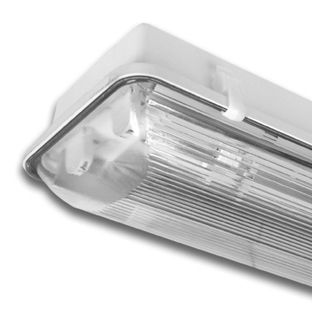 Additionally, our universal gasketed enclosure is designed to fully transform any strip light into a Vapor Tight fluorescent light diffuser. To order a vapor tight enclosure from Diffuser Specialist simply fill out the form below. A highly trained Diffuser team member will be in touch to fully process your order and take payment. Our En-Seal™ gasketing offers unprecedented resistance to water absorption. En-Seal™ gasketing tested 100% moisture free after 144 hours of submersion as compared to conventional foam gasketing, where complete saturation is reached within one hour. After installing a U.L. listed fluorescent strip light or channel-type lighting fixture into the gasketed enclosure, the unit can be submitted to Underwriters Laboratories for a U.L. listing for use in wet or damp locations. Each vapor tight enclosure houses a standard one or two lamp strip fixture. Specialty sizes are available upon request. Additional accessories available as well. View Vapor Tight Enclosures, Replacement Lens, and Accessories Here. View Vapor Tight Order Worksheet Here. View Vapor Tight Replacement Parts Here.